Thanks for your mail ,Regarding the contract, . . the product called Crystallite Multicleanser.xhg this product is used in operating the ship, is a navigating product which directs the ship while in motion, actually many ship here in UK have not been able to move out for work for some time now due to scarcity and high cost of this product here. 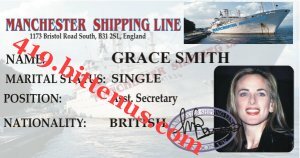 Now i want you to stand as the supplier of this product to the engineers which will be coming from our manchester shipping company here in UK to buy this product there in Asia Malaysia as i will be the one to introduce you here in our shipping company as the distributor of this product in Asia. This contract is going to be continues contract as far as you will be capable to handle it well,am also going to send you the scan picture of the product and its function as it is in the ship.i will be given you the contact of the distributor in malaysia so that you can contact them and know if they have the product at the moment. Please get back to me soon to tell me your capabitlity of handling this business.and we need your full comprehensive contact information kindly drop your name. mobile number emaill adress. country.fax number.